In December 2010 Paul contracted swine flu, developing serious complications. He was in intensive care for 16 days in an induced coma on a ventilator for that time and also underwent a tracheotomy. He was in hospital for 8 weeks and following that was unable to do anything for himself. He was in a wheelchair for some months and therefore unable to exercise. Once out of the wheelchair Paul continued to stay physically weak often finding himself out of breath while also encountering issues with his strength and balance. Not only was his physical state affected but also his mental state. His confidence was rocked and he just wasn’t the same boy. He also gained a great deal of weight. A year after his illness Paul’s parents Chris and Theresa decided that a fitness regime was in need to help Paul regain his strength. Paul had his first session in the gym with Gordon in December 2011. The progress he has made is absolutely unbelievable. He’s able to run on the treadmill. On the cross trainer he manages to ramp his speed up to 11 km/h! His balance has improved so much that he’s able to perform step ups onto a BOSU. He squats 35kg, deadlifts 35kg and benches 25kg – all for 15 reps! He’s also managed to shed over 2 stone – not bad for a guy who’s 4 ft 8! Paul is now a regular fixture in the gym. 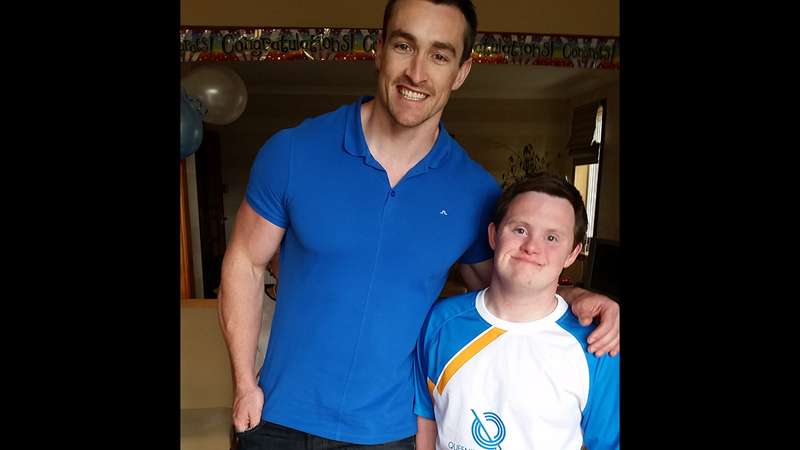 He not only trains with Gordon every week but he also uses the gym with his carers as well as swimming regularly. The members are very fond of him – he’s built up a real fan base! He really is a credit to himself and his family. He’s also a great example of someone who was up against the odds and through determination and will power has managed to turn his life around. We’re all immensely proud of him! Well done Paul!